The Department's paleontology collections include specimens that are both the property of the Museum and specimens on extended or permanent ﻿loan. The collections range from invertebrate fossils collected in Florida, to vertebrate and invertebrate fossils obtained by our field teams at excavation sites throughout the American west, principally the Lance and Hell Creek Formations of Wyoming and the Dakotas. As a result of the Museum's ongoing field work, new additions to the collection appear each year following the field season. The specimens enumerated here are a partial listing. 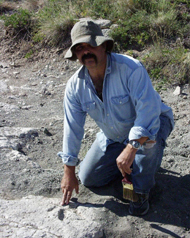 Research Access: To schedule access to the research collection, contact our Curator of Paleontology, Robert A. Depalma.